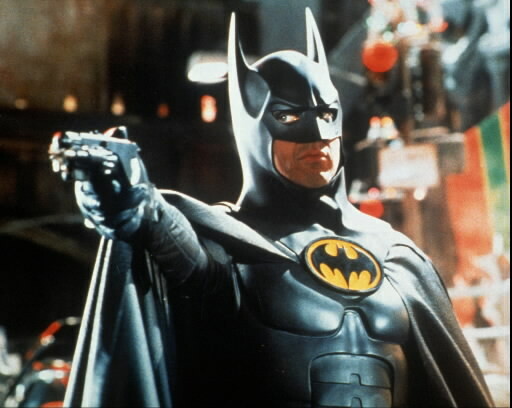 In many ways, 1989’s Batman was the prototype for all subsequent superhero blockbusters. Marketing played a big role in the success of the film as did the larger than life visuals and performance of Jack Nicholson as The Joker. At the time, it was the highest grossing film during an opening weekend in addition to some other records as well. Given the overwhelming commercial success, director Tim Burton was baited into directing a sequel on the condition he was given full creative freedom. The offer was too good to pass up and Batman Returns was released in 1992. 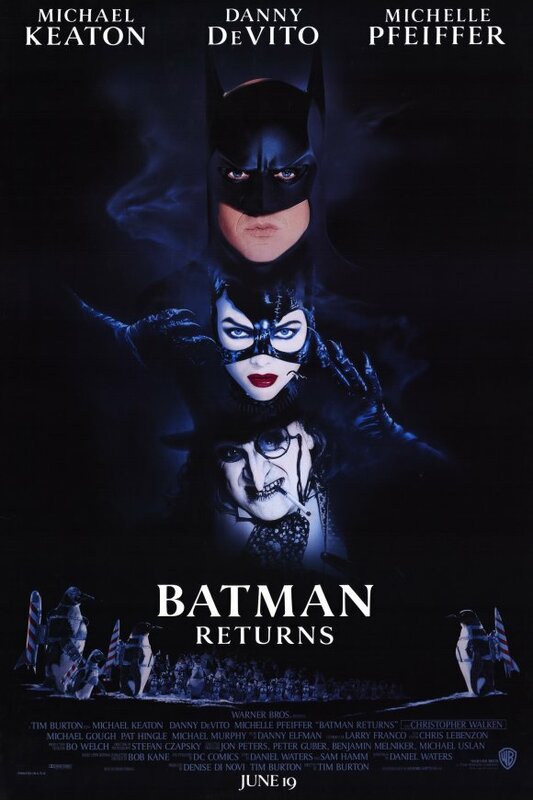 With Batman v. Superman: Dawn of Justice on the horizon, I decided to go back and revisit Batman Returns. It’s a film that I’ve seen several times but for some reason it leaves me feeling cold after each viewing. It’s not a film that I want to hate by any means. Not only am I a Batman fan, but there’s a lot of elements within the film that impress me every time. It contains astounding production design and sets, some beautiful imagery, and a memorable performance by Michelle Pfeiffer as Catwoman. After seeing it for probably the tenth time, I was once again disappointed. 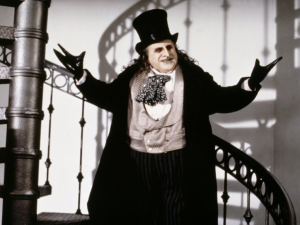 Although a sequel, Batman Returns feels very different from its predecessor. Due to Burton’s conditional control over the production, it’s a much more stylized and visually driven film. The snow covered landscapes of Gotham City draw more from the imagery of Edward Scissorhands than Batman. Gotham feels and looks like an entirely different city. To be honest though, all of the cities depicted in the Burton/Schumacher era of Batman bear little resemblance to one another as the films progress. Because of this, it’s difficult to feel any sense of continuity between this film and Batman save for returning cast members and characters. Like a lot of Tim Burton films, the plot is rather lackluster and occasionally contrived. 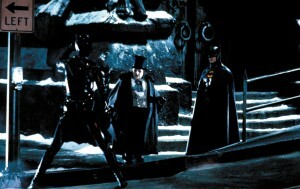 At the beginning of the movie, we see the Cobblepot family throw their deformed baby into the sewers of Gotham. 33 years later, the baby arises as Penguin (Danny Devito), leader of the Red Triangle Circus Gang. During one of their riots, Batman (Michael Keaton) arrives to take care of business while Penguin kidnaps crooked businessman Max Shreck (Christopher Walken). Penguin blackmails Shreck in order to achieve his goal of reentering Gotham society albeit with ulterior motives as well. The two hatch a scheme to reintroduce Penguin as a civilized member of society in order to elect Penguin as the mayor of Gotham. At the same time, Shreck’s meek secretary Selina Kyle (Michelle Pfeiffer) accidentally uncovers some of Shreck’s misdeeds and is subsequently pushed out of a window by Shreck. After being revived by a group of cats, Kyle suffers a mental breakdown and becomes the vigilante Catwoman who soon crosses paths with both Penguin and Batman. When the phrase “style over substance” is brought up in film criticism, Batman Returns is one of the first films that I think of. The style and the haunting score by Danny Elfman feel like cover ups for a nonsensical story and script. While Batman suffers from a similar issue, Nicholson brings so much presence and charisma to the screen that it’s easy to overlook some of the scripting and pacing issues. Not only that, it’s much more consistent tonally and isn’t as ridiculously absurd as Batman Returns. For starters, Selina Kyle is resurrected by cats with no explanation as to why. It’s a moment that takes me out of the film each and every time I see it. It’s so ridiculously out of place that it almost makes me forgive Halle Berry’s Catwoman at least as far as the origin goes. From there, it gets more and more absurd. Catwoman can cheat death a la the nine lives motif and Penguin utilizes an army of penguins with rockets strapped to their backs for his final plan. I find all of the characters to be completely unlikable. As a result, it doesn’t phase me at all when something terrible happens to one of them. Much like Batman, Batman Returns continues the trend of letting the villains overshadow Batman. I’d consider this film to be the biggest offender of the four Burton/Schumacher films. Batman really feels like the third wheel in this story. He’s only there to fight the villains and to have a romantic relationship with Selina Kyle just because she’s the sole female lead in the film. Speaking of which, nothing about the relationship between Bruce and Selina feels authentic. It’s obvious Selina has some sort of mental disorder but for some reason Bruce inexplicably falls in love with her. Even Alfred points out how crazy it is for Bruce to engage in a relationship with her. With all that said, their dance at the big Christmas ball towards the end of the film feels like a scene worthy of the Batman mythos. It perfectly encapsulates the theme of identity and the spitfire relationship between Batman and Catwoman in the comics. While each of the villains has moments of subtle nuance, none of them measure up to The Joker. Shreck is your run of the mill corrupt businessman despite Walken bringing his trademark eccentricities to the role. Penguin and Catwoman feel like excuses to cater to Burtons’ sensibilities as opposed to staying true to their comic book counterparts. I wouldn’t have minded the decision to change Penguin from an intellectual mobster to a crude mutant if it didn’t feel like change for the sake of change. He has little depth and Devito’s performance is rather one note. It lacks the nuances that made The Joker such an iconic villain. We’re supposed to sympathize with Penguin, but it’s difficult to do so given his vulgar nature and tendency to make gross puns and bad jokes. For someone who grew up in the sewers of Gotham, he sure does know how to deliver some eloquent dialogue and speeches. As Catwoman, Pfeiffer steals just about every scene she is in. As Selina Kyle, she is not a compelling character. She’s whiny, insecure, and a little too over the top at points. Even after she is resurrected, she’s still insecure out of the costume. Her fight scenes with Batman lead to some awkward moments, including Batman stumbling to retaliate after Catwoman proclaims after being hit, “How could you? I’m a woman.” The fight choreography and action scenes are much better than the ones in Batman, but they’re nothing spectacular. Much like the trend of the villains overshadowing Batman, Batman Returns begins the trend of having two villains team up in a contrived manner solely based on run ins with Batman. Many point to Batman Returns being too “dark” as the reason for Joel Schumacher taking over the franchise. I don’t think it’s too dark as much as it is too vulgar and nonsensical. I’d like to point out that there are a couple of scenes that could have been taken right out of Batman Returns and placed into a Schumacher film. Case in point, Penguin hijacking the Batmobile via his own little amusement park ride version or the rocket wielding penguins in the climax. Like I said, almost all of my positives are directed towards the production design and tecnical aspects of the film. As a movie with story and characters at the center, Batman Returns feels very hollow and distant. I’m not going to say Batman Forever was necessary at the time, but it was a step in the right direction for the franchise. It’s not a great film, but I think it’s an improvement over Batman Returns.